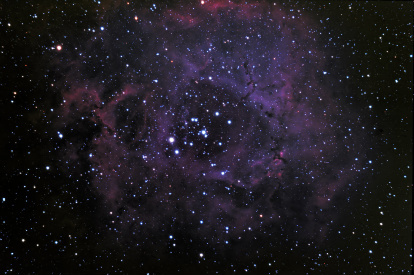 Rosette Nebula, a LLRGB picture taken with Canon 20Da, ISO800 and WO FLT-110 without field flattener for FLT used. Total exposure time 3hours(subs 16*5min + 10*10min). Dark and flat frames used. Filter: 2" IDAS LPS. Guide via Meade 16" LX200ACF, FR3.3 and DSI-II Camera. Picture taken 14-Febr-09.